Product #1239 | SKU EF30028LISII | 0.0 (no ratings yet) Thanks for your rating! 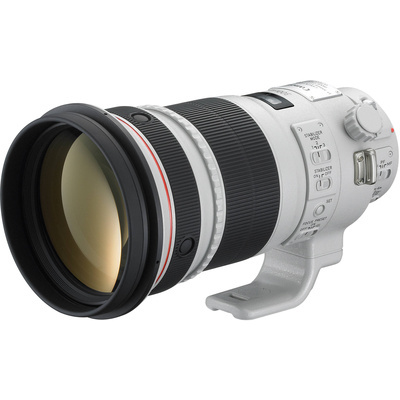 The EF 300mm f/2.8L IS II USM Lens from Canon is the perfect choice for nature, wildlife and sports photographers. Using the three mode Optical Image Stabilisation allows you to shoot at shutter speeds 4 stops slower, and the advanced third IS mode activates only when the shutter button is fully pressed, so you can pan with fast-moving subjects without the IS function interfering with composition and framing. An ultrasonic autofocus motor (USM) enables smooth, fast and quiet autofocus and a Power Focus mode allows smooth focus change which is especially important while shooting video. A focus preset function allows you to store focusing positions and return to them in an instant when needed. An AF stop button will pause autofocus with just a touch and manual focus override allows precise manual focus even in AF mode. Dust and water sealing keeps the lens functioning even in less than ideal conditions and magnesium and titanium construction elements make it lighter than its predecessor. Fluorine coating on the front and rear lens surfaces allows dirt to be removed easily and an attachment slot is provided for a wire-type security lock. The EF 300mm f/2.8L is compatible with Canon's EF1.4x III and EF2x III extenders and this lens includes a lens hood, 52mm drop-in gelatin filter holder, a detachable tripod collar and a hard travel case. Three IS (Image Stabilisation) modes offer a 4-stop shutter speed advantage. Advanced image stabilisation Mode 3 activates only when shutter button is fully pressed, allowing for panning to follow fast-moving subjects. Focusing distance range can be selected with a switch on the lens barrel. By setting a suitable focusing distance range, actual autofocus time can be shortened. The three focusing ranges are 6.6-19.7', 19.7' to infinity and Full range. Detachable lens hood, a detachable, rotatable tripod collar, drop-in gelatin filter holder and hard travel case are supplied with the 300mm f/2.8L lens.